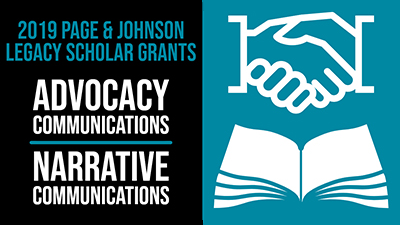 The Arthur W. Page Center announced funding for two important areas within the public communications field for its 2019 call for research proposals – advocacy communications and narratives in public communications. Page scholars were selected to create research projects that will build scholarly and public understanding of the two topics. The funding is a part of the Center’s Page/Legacy Scholar Grant program. The call was announced last September, and the Center received overwhelming interest in this year’s topics. From a large pool of proposals, more than 30 scholars were selected from universities in the United States, Australia and Turkey. The funded projects have the potential to help organizations innovate the way they engage in advocacy. Managed by Colleen Connolly-Ahern, associate professor of advertising-public relations at Penn State, the advocacy projects focus on corporate social responsibility, youth activism, advocacy for marginalized populations, among other topics. Areas of public health and social justice, specifically those focused on behavior change and social mobilization, were given priority. Connolly-Ahern, a Page Center senior research fellow, said the funded projects have the potential to help organizations innovate the way they engage in advocacy. The narrative call, managed by Fuyuan Shen, professor of advertising-public relations at Penn State, and Heidi Hatfield Edwards, professor of mass communications at Florida Institute of Technology, accepted research proposals on the effects, implications and cultural uses of narratives in public communications. Among the funded projects, topics include environmental messaging, digital media, crisis communication, women in politics and more. Each year, the Center invites scholars to propose research ideas that direct the field toward answers to difficult questions affecting the communications industry today. Past topics include “fake news,” digital media, CSR, immigration and sustainability. The 2019 scholars will have a year to complete their projects. Results are expected by July 1, 2020. Since its 2004 founding, the Page Center has become an international leader in research on ethics and integrity in public communication. Over the past 15 years, the Center has funded more than 200 scholars and awarded more than $870,000 in research funding.